Each entry must feature a single custom woodworking project (each, a “Project”) designed and/or built by the entrant. The Project must have been completed on or after January 1, 2017. The Project must have been built for an outside customer (someone other than the entrant his/her/itself or one of the Entrant’s employees). The Project may not have been previously submitted for the Best in Wood (formerly known as Custom Woodworking Design Portfolio) Awards. Each Entry must be accompanied by at least three (3) professional-quality, color images (equivalent to 266 DPI or higher). Contact Michaelle Bradford at michaelle.bradford@woodworkingnetwork.com if you have additional questions. Images will not be returned. Please email david.biggs@woodworkingnetwork.com with any technical questions or issues. Are you a subscriber to our magazines and newsletters? Get your free subscription today. 1. Enter your full name (first & last) below: *This question is required. 4. Company Name: *This question is required. 5. How many employees at your location? 6. Company Address (Street and/or PO Box): *This question is required. 7. City, State & Zip Code *This question is required. 9. Category: *This question is required. 10. Project Title: *This question is required. 11. Project Description: *This question is required. 12. Project Construction Details: *This question is required. 13. Materials Used: *This question is required. 14. Equipment and/or Software Used *This question is required. 15. Upload your photos: minimum of 3 photos required (you may also upload videos in mov or mp4 format less than 50MB in size) *This question is required. 16. 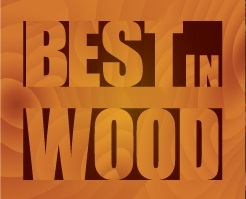 There is a one-time processing fee of $30.00 to enter the Best in Wood (formerly known as Custom Woodworking Design Portfolio) Awards.